KILMORE DIOCESAN PILGRIMAGE TO FATIMA – A group of pilgrims from across the Diocese of Kilmore and beyond travelled to Fatima recently to mark the centenary of the Apparitions there. 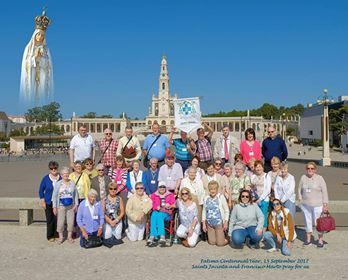 The group had a full programme of spiritual exercises during the course of the week-long pilgrimage which included a trip to Lisbon to visit places associated with St. Anthony. One of the highlights of the pilgrimage was the lighting of a special Diocesan Candle at the Shrine which symbolised the offering of intentions by the pilgrims themselves as well as those who wished to be remembered there but were unable to travel. The Pilgrimage Director was Seán Coll, Director of the Kilmore Diocesan Pastoral Centre. Fr. Tom Mannion, PP Ballinaglera, was the Pilgrimage Spiritual Director.